Hi-Rez Studios are making major announcements concerning three of their games today at DreamHack Valencia, Spain’s big LAN and esports party. Hand of the Gods: Smite Tactics is entering open beta, Paladins is getting a new champion and a new map, and Smite is getting a polish overhaul so thorough it has its own name: Project Olympus. Hi-Rez make some of the best free-to-play games on PC, with Paladins and Smite both making our list. Formerly called Smite Tactics, Hand of the Gods has evolved and assimilated its predecessor’s name into its own as a subtitle. It’s a turn-based strategy card game in the Smite universe, and has been in closed beta since January. 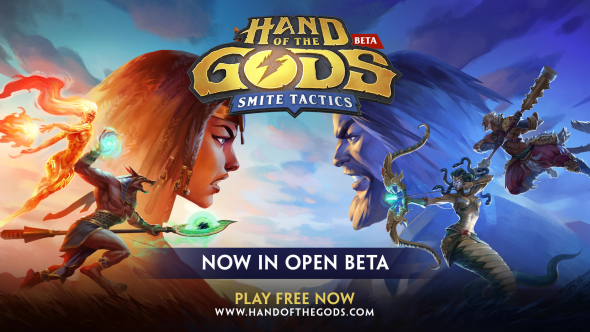 It goes into open beta today, and it’s free-to-play – head over to the Hand of the Gods website to download it and give it a try, no key required. Meanwhile, the first-person action-MOBA Paladins is getting its 30th Champion: Jenos, the Ascended, a support champion with “an astral flair,” according to Hi-Rez. Jenos will be the tenth Champion released in Paladins this year – a pretty impressive turnover rate. Paladins is also getting a new map: Splitstone Quarry, the latest product in the game’s test map queue, where early boxed-out map prototypes are shared with players and developed iteratively with their feedback. Hi-Rez have also announced a rework for Ruckus, a frontline champion, to better root him in Paladins lore. Finally, onto Smite, the third-person MOBA. It’s getting a major new initiative named Project Olympus, which is “intended to improve core game features” and introduce “quality-of-life gameplay improvements.” The first phase will roll out over the next three patches, and will continue through the start of season five, which is projected for January next year. Engine and systems upgrades, including a 64-bit client and support for higher-resolution textures. An improved in-game knowledge bank, full of tutorial videos to help new players learn the game and existing players improve their skills. If you’re a fan of Hi-Rez’s games in a competitive setting then you’ll want to know that both Smite and Paladins are holding tournaments this weekend. Check out theirDreamHack broadcast schedule for details on when and how to watch.